Mister Baggins is definitely a staff and volunteer favorite at our Escondido Campus. This poor kitty was relinquished to us when his owner of 13 years had to move. We soon discovered that his fur was matted and he had previously undiagnosed diabetes. Despite all that he's been through at his advanced age, Mister Baggins is a total sweetheart who loves to be pet and have company. In fact, our volunteers think he might make an excellent therapy cat. 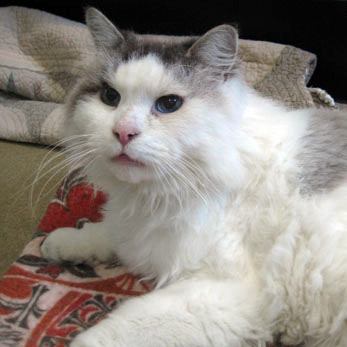 Mister Baggins also hopes that his age won't fool you, because he is still quite playful! What Mister Baggins will need from his new family: ongoing care for his diabetes mellitus. Diabetes in cats is similar to diabetes in people. The body is unable to use glucose (blood sugar) for energy because of a malfunction. Either there isn't enough insulin being produced by the pancreas, or the body has become resistant to it and now requires supplementation. Mister Baggins will need daily insulin injections, likely for the rest of his life. With dietary control and other variations, some cats may reach periods where they no longer need insulin. You should never change the insulin dose without consulting your veterinarian, however. Diabetic cats should have testing run every 3 to 6 months, even if everything appears to be going fine. It will also be important to recognize the signs of a potential problem. Excessive drinking, excessive urination, and weight loss are just a few of the most common signs noted. Diabetes can be difficult to regulate in cats. Therefore, it is important to recognize the signs of a potential problem. You should speak with your regular veterinarian before making the decision to adopt this animal. As the new owner you will be responsible for the care of the diabetes and any other problems that may arise. We sincerely appreciate adopters that are willing to provide special homes for kitties like Mister Baggins and we gladly waive the adoption fee. If you're considering meeting Mister Baggins and would like more information, you can visit with one of our counselors or contact our Director of Rescue and Recovery, Sarah Thompson, at [email protected] for transfer to a rescue group. To meet Mister Baggins, come on by our Escondido Campus today! Adoption Counselors play a key role, helping guests find animals to love who will also work with their lifestyle and home environment.